McDonald's is conveniently positioned on Uttoxeter Road, approximately 0.89 miles north from the centre of Uttoxeter, in Kingstone (nearby Ashbourne Road). This restaurant provides service chiefly to the areas of Balance Hill, The Wharf, Park View Farm, Stramshall, Uttoxeter Town Centre, The Heath, Blount's Green and Mount Pleasant. Doors are open here today (Friday) nonstop. Read the specifics on this page for McDonald's Uttoxeter, including the working times, map, direct number and further details. McDonald's is set not far from the crossroads of Uttoxeter Road, New Road and Pigeonhay Lane, in Kingstone, Uttoxeter. 1 minute trip from Greenacres Drive, Spath Roundabout, Ashbourne Road or Stramshall Road; a 5 minute drive from New Road Roundabout, Ashboune Road and Cheadle Road; and a 11 minute drive from A50 or Old Knotty Way. Please use ST14 5AA for the restaurant via Sat Nav. Buses arrive and depart from House No 1, Stanley Crescent, Park Avenue and Ashbourne Road. The train runs to Uttoxeter Station (1.14 mi away). Arrive here by the East Midlands Trains line. If traveling by foot you might visit Uttoxeter Pentecostal Church, Heath Mission Church, Pennycroft Park Pumptrack, Windorsor Park C of E Middle School, St. Mary´s Ce (A) First School and Thomas Alleyne's High School. 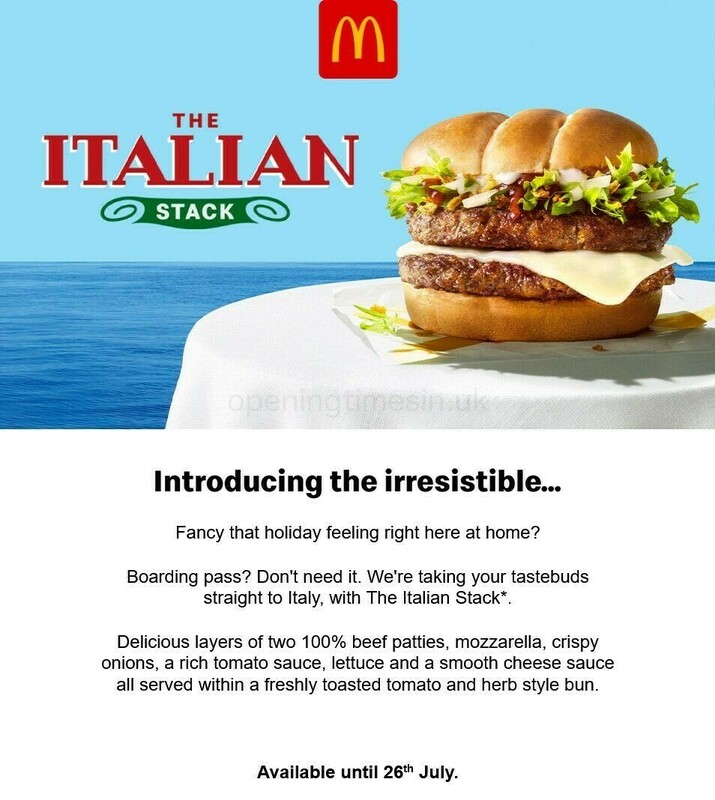 There is currently 1 McDonald's location operational in Uttoxeter, Staffordshire. Click on this page for the full index of all McDonald's restaurants near Uttoxeter. Please note, usual business times for McDonald's in Uttoxeter may shift during legal holidays. The changes apply to Xmas Day, New Year's Day, Easter Sunday or Early May Bank Holiday. Take a look at the official homepage when planning your trip to McDonald's Uttoxeter, or phone the service number at 370 524 4622 for detailed info about the seasonal working hours. Help our team keep the information as up to date as possible. If you find discrepancies in the contact info or opening times for McDonald's in Uttoxeter, please let us know by utilizing the report a problem form. Please feel free to support potential patrons by writing your comments on McDonald's in the space provided below.